LDR is Light Dependent Resistor works on the principle of Photo conductivity. It completely depends on the intensity of the light falls upon it. When the light falls on it, the resistance value gets decreased and when there is no light i.e. if it is kept in the dark place then the resistivity increases and its resistance will be high. Transistor is generally of two types NPN transistor and PNP transistor. 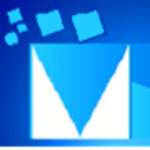 The transistor type used here is NPN transistor. Transistor is connected here as a darlington pair. A Darlington pair is two transistors that act as a single transistor but with a much higher current gain. 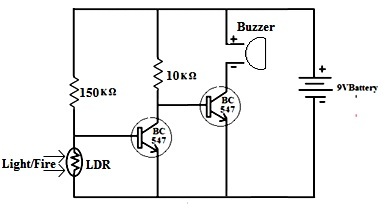 3.Buzzer: A buzzer is an audio signalling device that produces an alarm when some signal is obtained. 4. Resistors: Resistors given in the circuit is to limit the current in the circuit. 5. Battery: 9V Battery is connected to the circuit as the power supply. This is a simple circuit. The Transistor performs the switching operation to switch ON and OFF the Buzzer based on which it will produce alarm. Here, the transistor switches ON the circuit and activates the Buzzer and alarm is produced when the light falls on the LDR. By default the circuit will be in OFF state and Buzzer will not be activated when the sunlight is not present i.e during night time. 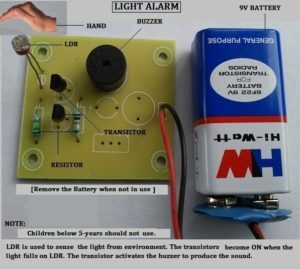 It automatically switches ON the buzzer producing alarm when Sunlight fall on it ( i.e on LDR ) Thus making it automatic morning alarm, by using a sensor called LDR (Light Dependent Resistor) which senses the light.